I have a new knitting pattern to tell you all about today and a giveaway! My newest pattern is for the Peek-A-Boo Fingerless Mitts. 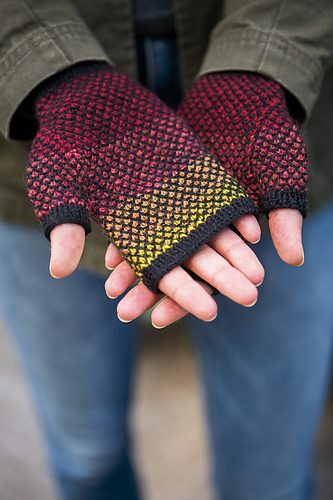 These mitts use broken seed stitch to create a pattern that looks like your done complicated colorwork, but really it’s just knits and purls. There’s no stranding or slipped stitches. I chose a color palette that made me think of hot lava coming through black lava rocks. You could do these in any colors you wanted though. I think they would look very icy in a palette of soft blues with a white background. It is part of a new book from Knit Picks called Cute & Cozy Stashbusters. It is also available as a single pattern download. 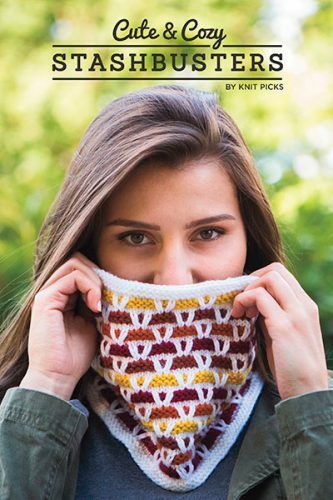 The book features sixteen patterns to help use up all your bits and ends of yarn. I have one digital copy of this book to giveaway! If you would like to enter find all the details in my Ravelry group. Good luck! 6 months ago by Kat in Knitting , Needlecraft | You can follow any responses to this entry through the RSS feed. You can leave a response, or trackback from your own site.